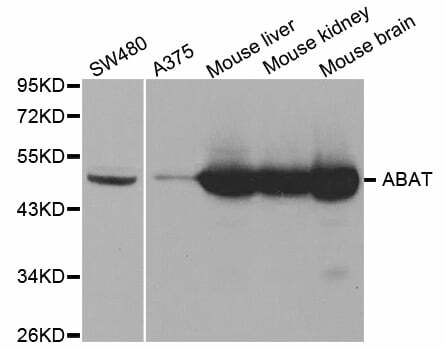 The antibody detects endogenous level of total ABAT protein. Recombinant protein of human ABAT. 4-aminobutyrate aminotransferase (ABAT) is responsible for catabolism of gamma-aminobutyric acid (GABA), an important, mostly inhibitory neurotransmitter in the central nervous system, into succinic semialdehyde. The active enzyme is a homodimer of 50-kD subunits complexed to pyridoxal-5-phosphate. The protein sequence is over 95% similar to the pig protein. GABA is estimated to be present in nearly one-third of human synapses. ABAT in liver and brain is controlled by 2 codominant alleles with a frequency in a Caucasian population of 0.56 and 0.44. The ABAT deficiency phenotype includes psychomotor retardation, hypotonia, hyperreflexia, lethargy, refractory seizures, and EEG abnormalities. Multiple alternatively spliced transcript variants encoding the same protein isoform have been found for this gene. Western blot analysis of extracts of various cell lines, using ABAT antibody. 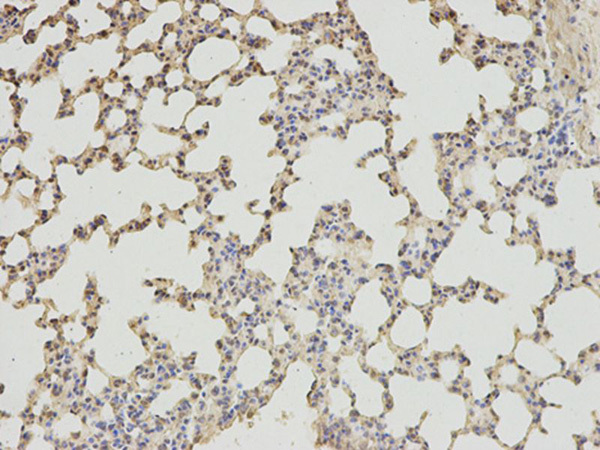 Immunohistochemical analysis of paraffin-embedded mouse lung using ABAT antibody at dilution of 1:200 (200x lens). 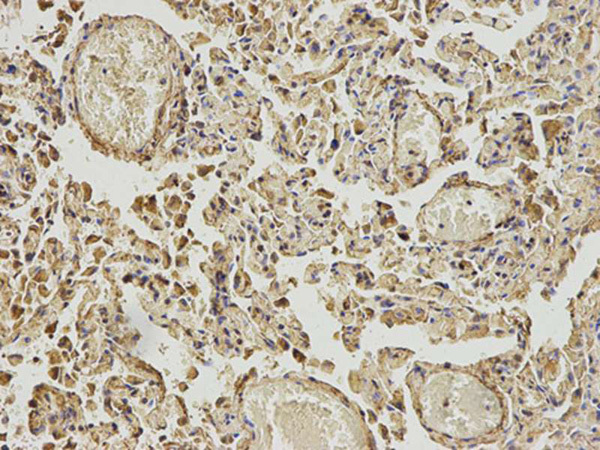 Immunohistochemical analysis of paraffin-embedded human lung using ABAT antibody at dilution of 1:200 (200x lens). 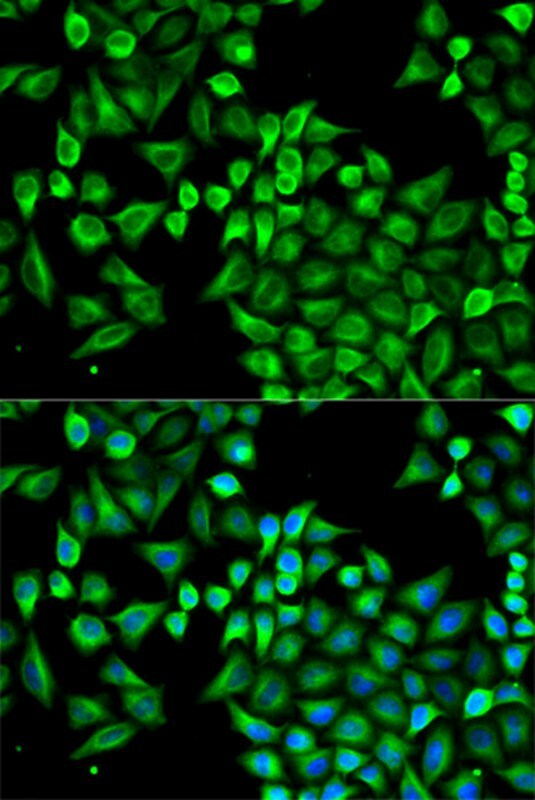 Immunofluorescence analysis of A549 cell using ABAT antibody. Blue: DAPI for nuclear staining. 1. A-to-G transition at nucleotide 754 of the human ABAT gene identified in lymphoblast cDNA (c.754A>G) results in substitution of an invariant arginine at amino acid 220 by lysine (p.Arg220Lys). This point mutation results in destabilization of the binding of pyridoxal-5'-phosphate to GABA-transaminase (required for transamination of GABA to succinic semialdehyde) and thus results in GABA-transaminase deficiency.